To coincide with the 20th anniversary of the former and 10th anniversary of the latter, Sony Pictures has put out new Blu-ray editions of Jumanji and Zathura, a pair of classic and thematically similar adventure films, that were both adapted from Chris Van Allsburg books. 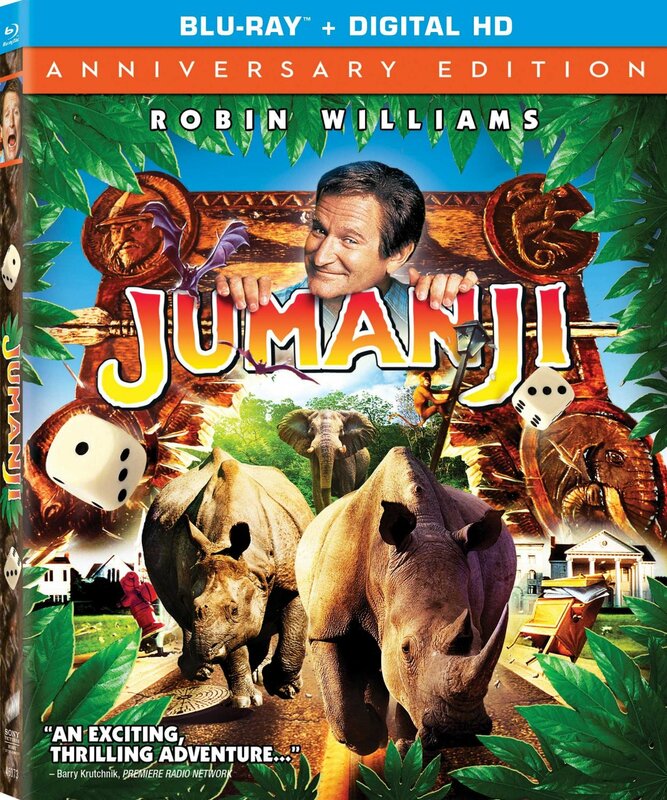 Released in 1995, and becoming a breakout hit, Jumanji follows Alan Parrish (Robin Williams), a man who has been trapped for decades in a jungle-themed board game, only to be released by siblings Judy (Kirsten Dunst) and Peter Shephard (Bradley Pierce). But when they start to play, they unleash hoards of wild animals and other dangers, which can only be stopped by working together and finishing the game once and for all. Although some of the special effects are admittedly dated by current standards, particularly those mischievous monkeys, director Joe Johnston has crafted a family classic that continues to endure. Robin Williams brings a welcome comic presence to the film, but the late actor also provides an emotional anchor to the story, in one of his most popular roles. With its heart squarely in the right place, and a certain old school charm in its penchant for good-natured thrills, Jumanji is a fun adventure film that still offers ample entertainment value. The Blu-ray includes a commentary track with the special effects crew, three “behind the scenes” featurettes, storyboard comparisons, two episodes from Jumanji: The Animated Series, and a motion storybook read by Chris Van Allsburg. There is also an extended preview for Goosebumps, with the young actors from the upcoming film briefly reflecting on their memories of Jumanji. Jumanji is 104 minutes and rated PG. Released in 2005, Zathura is the story of young brothers Danny (Jonah Bobo) and Walter (Josh Hutcherson), who find an old mechanical board game that sends their house hurtling through space, with their older sister (Kristen Stewart) also on board. As they struggle to finish the game and get back down to earth before their father (Tim Robbins) gets home, they find themselves battling aliens and taken on a wild space adventure, with help from a mysterious astronaut (Dax Shepard). Directed by Jon Favreau, who chose to use practical effects whenever possible, Zathura is simply a lot of fun, and a worthy throwback to the family adventures that both inspired and preceded it, filled with clever twists, solid performances and entertaining action. Although failing to even recoup its relatively modest production budget back in theatres, this is a wildly successful piece of old school science fiction, that absolutely deserves to find a new audience on Blu-ray. The Blu-ray includes commentary with Jon Favreau and co-producer Peter Billingsley, seven “behind the scenes” featurettes, and a motion storybook read by Chris Van Allsburg. There is also an extended preview for Goosebumps, with the young actors discussing their memories of Zathura. Zathura is 101 minutes and rated PG.